If the weather-stripping on any of your outside doors looks like this, you need to replace it and now that the cold weather has arrived, if you haven’t already done so, now is the time to tackle this easy project. That gap between the door and the floor is big enough to let a lot of warm air out of a house which wastes energy and makes it harder to be comfortable inside. It may seem that a little detail such as this can’t make a big difference but the truth is, all the little ways your house lets heat out adds up to a big expensive picture. 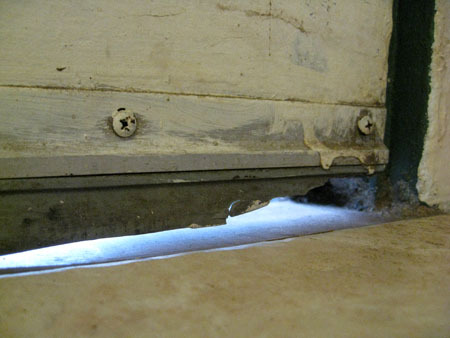 Big gaps under doors is a great place to start sealing your house against the cold. The tools you will need: Power drill (or screw driver and hand drill)*, hack saw, metal file, scissors, pencil, replacement weather-stripping (door sweep) for doors, and possibly a tape measure. 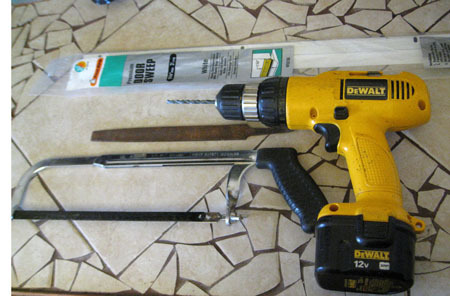 First Step: Using the reverse mode on your power drill with the appropriate sized screw driver bit, remove the screws from the existing weather-stripping and pull it off the bottom of your door. Carefully line up one end of the old weather-stripping with the new and if they aren’t the same size use a pencil to mark the difference in the size. In my local farm store there was only one size of weather-stripping available (“standard”) which fits a standard sized door such as a front door. My kitchen door is narrower than a standard door so I had to cut my weather-stripping down. If you don’t need to cut yours to size, skip to the last step! Second Step: Before you cut the metal part of the weather-stripping with a hack saw you need to cut the rubber sweep with scissors, as shown above. 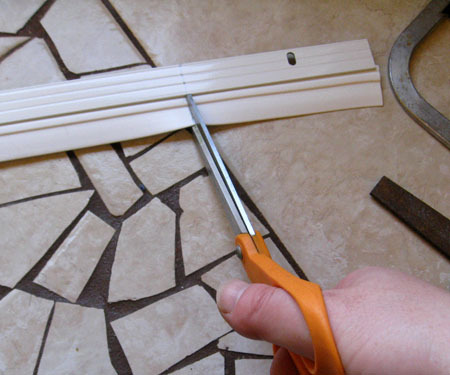 Third Step: Use a hack saw to cut through the metal part of the weather-stripping. 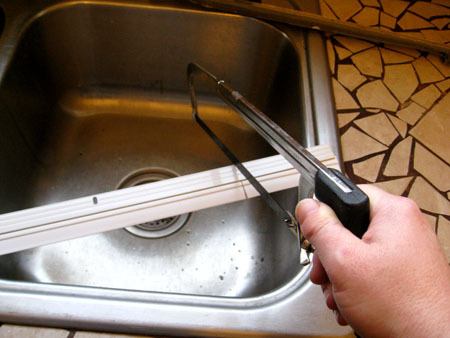 I balanced mine over my sink but you can also use two saw horses to do the job if you have them handy. Start sawing slowly and straight, once your cutting line is established you can go more quickly. The main thing is to saw in a smooth straight motion, if you angle your saw at all it will get stuck. When you’ve cut all the way through the metal, carefully feel the edge- if it’s rough and there are any jagged bits, use a metal file to smooth them out. 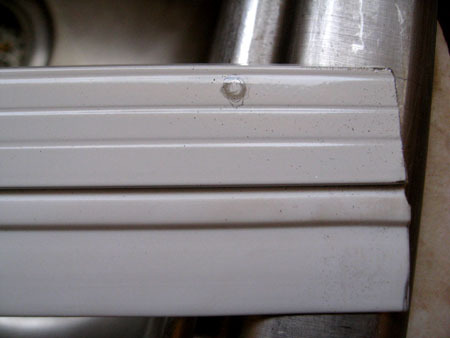 You don’t want to have anything sharp protruding from the bottom edge of your door where it can catch on socks or skin! Fourth Step: weather-stripping comes with pre-drilled holes, if you cut it down you will almost certainly need to add one to the cut end so that both ends of the weather-stripping are securely screwed to the door. 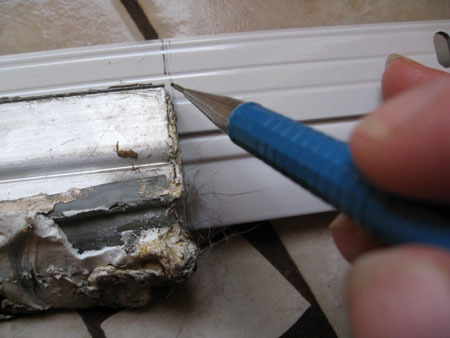 Use your old piece of weather-stripping to determine where the end hole should be. Line it up evenly with the new piece and using a pencil, mark where the hole needs to be. Fifth Step: Use a drill bit that matches the size of the hole. You can figure this out by fitting drill bits into the pre-drilled holes until you find the right size. Start drilling the hole. 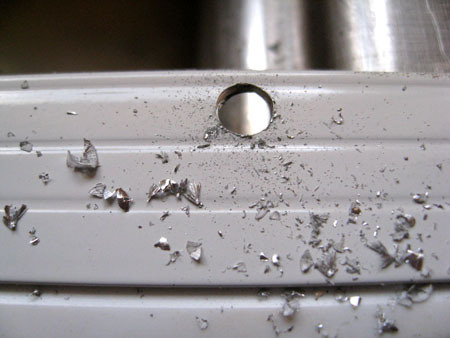 Be sure to hold the drill with a steady hand because the metal will give some resistance at first. Put some downward pressure on the drill but not so hard that it can bend the metal you’re drilling through. 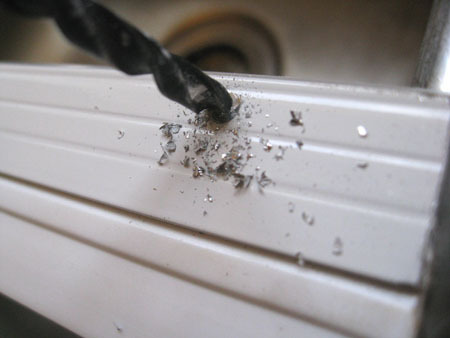 Be careful to clean up the metal dust because it can be sharp! 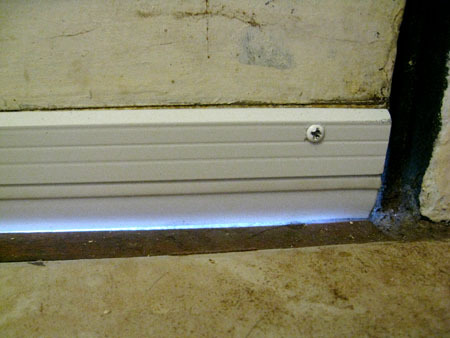 Sixth Step: Position your weather-stripping on the bottom of the door so that the rubber sweep just touches the floor. You don’t want the rubber to be low enough to bend or drag on the floor because it will be ruined quickly with all the opening and shutting of the door. You want it to just make contact. My floor is uneven, being an old house means many surfaces are not even, do the best you can. Screw it into place using the holes provided (and the one you drilled if you had to customize the size). That’s it! Project Notes: As you can see, if the door your working with is standard size, replacing old weather-stripping is unbelievably easy. You just remove the old and screw on the new. You may notice I didn’t include any uses for the tape measure- yet it’s on the list of tools. This is because there may be rare instances where you are putting weather-stripping on a door that doesn’t already have it. In this instance you will need to carefully measure the bottom of your door to determine if you need to cut down your weather-stripping or not. This entry was posted in DIY journal and projects on November 14, 2009 by angelina. Do you have any tips about what to do if your door frame is not square? On one of my doors you can see clear to the outside at one corner (not on the bottom), and I am not sure how to best deal with the gap.